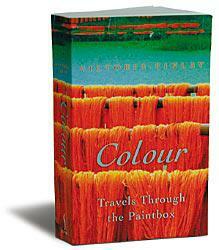 My most treasured book in my bookshelf is ‘Colour: Travels Through The Paint Box’ by Victoria Finlay. (Note, the book has various covers). This book is one of the few books I cannot read enough times. The first time I read it it took me two years to finish. I re-read pages, chapters, highlighted sections, underlined key phrases…..I studied it. It is a book of such value and wealth … I can go on and on but I think you get the picture. 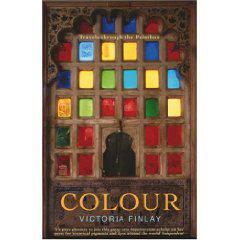 Victoria Finlay fell in love with colour as a little girl growing up in India. Her fascination with colour has lead her all over the world. She tells stories about the history of colours, how they came to be discovered, used and what they meant. It is not a book about chemical process or industrial science, or even fashion. It is about the people behind the paints and pigments that have been used for centuries. ‘Colour: Travels Through the Painbox’ is broken down into colour chapters: ochre, black and brown, white, red, orange, yellow, green blue, indigo and violet. Each chapter is full of stories…my favourite story is probably in the Red chapter about how a young explorer travel led through South America searching for the secret of the Spanish Red. He found it in the Cochineal beetle and managed to steal a few which he brought back to Europe. Nobody believed that the little white beetles were the source of the rich red and he died before Europe discovered he was telling the truth. Another fantastic story is the search for Indian Yellow. It was believed to be obtained by collecting the urine from a holy cow after it gorged on mango leaves! The book is absolutely wonderful! This entry was posted in Blog and tagged art, Book Review, Colour, Colour history, Colour: Travels through the painbox, Natural Dyes, Victoria Finlay. Your book sounds really interesting.Colour have a magicial fascination of our life.My favourite colour is blue – blue like the big SEA! Have a nice day and thank you for your nice mail. I read her book about gems recentlyâ€” over a few months too!â€” and I can’t wait to get a copy of this one. It looks just as fascinating.